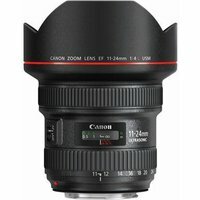 The Canon EF 11-24mm f/4L USM lens joins Canon's professional L-series of flagship lenses with complete range of ultra-wide-angle focal lengths in a single high-quality zoom lens. Perfect for capturing landscapes, architecture and interior shots, this lens is world's widest-angle rectilinear zoom lens with an advanced optical design involving 3 different kinds of lens coating to deliver superb image quality with minimal distortion. Near-silent autofocus and full-time manual override lets you fine tune focus without leaving AF mode.